BONUS: Free Cart Abandonment Automation! To fast-forward you through cart abandonment stats, your e-shop needs marketing automation, your business is craving automated, personalized marketing that is generated effortlessly. Following up from our latest blog post on the basics of cart abandonment, and our handy infographic on cart abandonment rates, we crunched some numbers on our databases and here are some cart abandonment stats we came up with. To help you find exactly what you are looking for, we’ve broken this guide down into a few handy sections based on the types of inspiration you might be looking. Let’s take a quick look at some general shopping cart abandonment statistics for you to consider when you are shaping your marketing plan! Out of all cart-retention intended emails that our users sent, a staggering 45% of them were opened, almost half of them, that is. Out of the opened emails, 21% of them received click-throughs. Half of the recipients who engaged with the content of the email completed their purchase. Want to find out more about cart abandonment stats? Keep reading! So, before exploring cart abandonment stats, it is essential to briefly go over cart abandonment and what it stands for. To read more on cart abandonment basics, click here. And If you are looking for more info take a look at Oberlo’s awesome Infographic about email marketing stats. Cart abandonment is a term we use to describe the instances of incomplete purchases on online environments. By and large, it refers to potential eCommerce store customers who add products to their carts and drop out before they complete the checkout process. But, with a staggering average of 69% of online carts being abandoned by users, more and more businesses and freelancers are turning to email marketing automation and SMS marketing to tackle these percentages. Impressive how marketers and email-marketing-savvy professionals are growing their cart retention percentages – most of all, effortlessly! More specifically, every cart that is abandoned triggers a cart abandonment email to go off within a designated amount of time. The e-shop visitor who abandoned receives an email that reflects their cart and items-to-be-purchased and invites them to complete their purchase. This email serves as a reminder, and businesses use it to offer additional motives, such as a discount coupon or free shipping. This way, businesses manage to retrieve almost one-third of their purchases. What are cart abandonment stats? Cart abandonment stats are drawn from several industries, from finance to clothing, you name it. While they go by many names (booking abandonment, insurance quote abandonment, etc. ), they all refer to incomplete transactions on behalf of potential customers who engaged with the eshop. We have compiled a number of them in a handy infographic on cart abandonment rates for your reference. 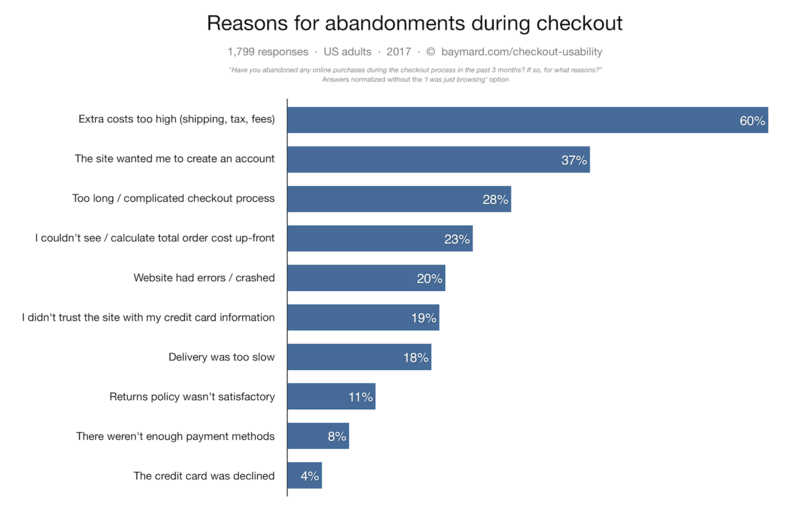 Interestingly, cart abandonment stats do a great job shedding light to the consumer behavior behind incomplete tasks. This help broaden horizons for marketers to explore why customers behave the way they do, what influences their behavior (e.g. the effect of different time windows available to them to make a decision), and so on. Therefore, to provide a more user-centric experience online that encourages the desired customer behavior. With regard to the overall cart abandonment stats available, a point to consider, whatsoever, would be that the average figure does not accurately represent the vast range difference from industry to industry. As a case in point, some industries face cart abandonment as high as 80% while others as low as 60%. Why do I need cart abandonment stats? Primarily, because these stats will take a load off your chest! This is because cart abandonment stats will help you overcome the feeling of powerlessness or that there is something extraordinarily wrong with the product or the service you are offering. The fact that almost 7 out of 10 checkouts remain incomplete is indicative that yours is not a bad product or service (not necessarily, at least!). That being said, these stats imply that there is a variety of factors influencing purchases made on your e-shop. After all, the mere fact that visitors chose your website means that they are considering you as an option. Only they want something different from you. This improvement is where automated cart abandonment emails come in! You need cart abandonment stats to shed light to the reasons why consumers and leads alike are dropping out without purchasing. What if my cart abandonment rate is low? That’s great news, but you need to be proactive in your strategic planning. Regularly reviewing your customers’ experience on your e-shop helps you keep your customers pleased, ergo convert more, and stay ahead of your competitors. How do I use cart abandonment stats? First, use available cart abandonment stats of major businesses in the same industry as you, to spot red flags for your own website and e-shop. Use them reactively and proactively! Use your latest cart abandonment stats track records to discover what must be improved and what could be improved. Use them (: the stats) or lose them (: the users)! Head over to Google Analytics and track customer journeys. See where most customers drop out. Make changes accordingly. The following graph provides an accurate representation that is indicative of the cart abandonment situation in different regions of the world. It is worth noting that the global stats average is representative of many regions’ averages. Did you know that B2C marketers who have implemented Marketing Automations and a variety of automated workflows (Cart Abandonment, Lead Nurturing, etc.) are seeing a 50% increase in their conversion rates? This staggering dropout percentage reflects that even though Europe is not an early adopter of marketing technology, unlike the US, it suffers less from cart abandonment. That being said, this could be due to the fact that European companies are tapping into the developed marketing automation industry, therefore they are seeing results instantly, in comparison to US businesses which was probably a baptism of fire. Another reason that could stand up to critical examination is that European consumers still find cart abandonment emails impressive, as well as the technology of personalization behind these. This way, they feel that ignoring the cart abandonment email would be declining a real person who tailored that deal for them personally, and thus they convert, thinking highly of the company’s professionalism and customer service. As we talked about earlier, the average cart abandonment rate boasts an average of 69%, however, the highest percentages for industries deviate considerably from that number. According to recent studies, Listrak’s abandonment rate in 2016 stood at 78% while IBM’s in 2015 was marginally lower than 69%. While statista.com reported that, the online shopping cart abandonment rate per certain industries since Q2 2017 range between a striking 67.4% to a marked 83.7%. The particularly high abandonment rate in financial websites may imply the fierce competition and the time pressure of the fluid finance environment. Same goes for travel websites: consumers browse more often out of booking research rather than out of booking intention per se. As for NGOs, it seems that the majority of those who click “Send donation” drop out before they fill out the long forms they usually have to fill in. Fashion and Gaming seem to be the least affected of the given industries, due to the fact that both these industries are very active in remarketing practices and already have Marketing Automation in place, and are gradually dropping their cart abandonment rates. Finally, it’s time to closely examine the causes of cart abandonment during checkout. It is clear that, throughout all available stats that the most common cause for bailing on carts at checkout is shipping-cost related. With a plethora of causes potentially responsible for cart abandonment on your website, things would look gloomy, unless there were powerful automation workflows taking care of this! And the great news is that you don’t even have to build this yourself! You can simply grab it from our library of automation templates, and customize it in a few minutes’ time! More advanced or experienced users can find out about our dynamic content cart abandonment emails, over here. Also, make sure you check our handy infographic on cart abandonment rates. 45% of cart abandonment emails are opened; 21% of all is clicked on, while 50% of the users who clicked purchase. Shipping-related reasons attribute for over 60% of carts abandoned. Setting up an automated cart abandonment email is a great way to lower your cart abandonment rates. Offer free shipping to really boost the conversion of your cart abandonment emails. Until our next Cart Abandonment series post, let us keep you in the know: we’ll carefully craft an email for you every week! Just sign up over here, on the right! Why do you need these stats?